You can call me simple. To me that's not an insult. I enjoy simplicity. How can I best accomplish what I have set out to do today? How can I use what I accomplish today to accomplish my future goals? I believe the answer to these types of questions lies in the acquisition of simplicity. What are you complicating your life with? Why are you doing it? Is it benefiting you? Often I have found myself adding complexity to my life and forcing myself to expend mental or emotional energy that was unnecessary and unhelpful. To remedy these tangled knots, I have adopted several habits over the years to simplify my life. Simplicity is a bit of a paradox to me. People that impose simplicity into their lives do so at the expense of work--organization and prioritization. However, once this up-front work is performed, the simplified life is actually much less stressful and easier to manage. Conversely, the individual who dismisses simplicity as boring and/or useless will find themselves engulfed in a petrifying labyrinth of possessions, situations, relationships, and tasks that overwhelm their minds. 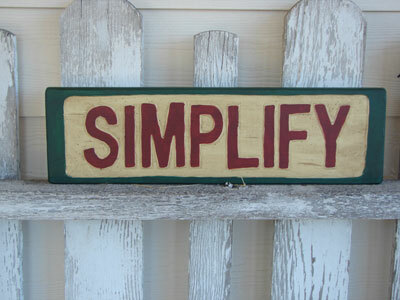 Have you taken inventory of your life lately and attempted to simplify? Have you considered what parts of your life are truly worth your time and energy and made clear decisions to expend your finite resources toward those ends? If you haven't, perhaps you should. It has been said that, "Simplicity is the ultimate sophistication." Steve Jobs is also quoted as saying, "Simple can be harder than complex. You have to work hard to get your thinking clean to make it simple; but it's worth it in the end, because once you get there, you can move mountains." I'm not saying that Steve Jobs is my hero, but he was clearly successful at what he put his mind to. Here are some ideas I've implemented in my life to keep it simple. Specific ideas relevant to your life might be very different than mine, but the principle should remain the same--focus. If you know what you intend to do with your time, you can accomplish far more than if you fly by the seat of your pants. I really have to work at planning--it's not in my DNA. But the more I've embraced it, the more I've reaped the benefits. If there are things in your life that you want to do but you just "don't have enough time", you are a perfect candidate for some scheduling simplicity. What makes a schedule simple? Well, you should be able to map out your day on a napkin. You don't have to sweat the minutia. Just brush some broad strokes and then stick to it. Time is like money--when you start keeping track of it, you suddenly have a lot more than you thought. Do you realize that everything you have is only as useful as it is accessible? Are you a person that has all the cool gadgets and gizmos but doesn't really know where they are? Have a place for things. If you can't think of a good place for it, sell it or give it away. If it's important enough, you will find a place; and that becomes its home. Every time you need it, it will be there, faithfully waiting to be used. Always set your keys in the same place when you come home. I suggest somewhere out of the reach of your children, if you have kids. I also suggest categorizing your drawers. You don't need to label them like a truly OCD person, but just know that each drawer has a general category. I have one drawer in our desk that is financial stuff. Another drawer is art stuff. Another is electronic stuff. The next time you're looking for something, you'll at least have an idea where it should be. To some folks, this translates into, "Never have fun--ever! Be as boring as you can possibly be." In fact, I am one of those people. Consistency is closely related to monotony. I can admit that; but not every moment of your life is going to be a party. Accepting this is part of growing up. Consistency in your habits and routines allows you to "coast" through the consistent parts of your life without much effort. It becomes "natural". That allows you to devote more of your time and energy to opening up new venues of your life or digging deeper into ones you are already dabbling in. In order to branch out, you must first have your foundation steady. Think of yourself as a train--consistently on the tracks but free to travel the world! Budgeting your money is important to simplify your life. If you decide on a budget before a month begins, it settles purchasing decisions ahead of time so you don't need to stress over them later in the month. I'm not saying we always stay without our budget. We still live on planet Earth. Remember that simplicity is all about focusing on what really matters. Spend your budgeting time thinking and stressing a little, but once it's done, it's done. You should not need to devote mental/emotional energy to finances again until next month. For the next 29 days you can enjoy the fruits of simplicity. Or use a voice recorder or something to record your random thoughts throughout the day. I get stressed out when I have fifteen things in my brain that I know are important and I need to keep track of. If I don't get them on paper or into a computer quickly, they will vanish; and I will get mad. Simplify your life with a to-do list. #6 Have a filing system--physical and digital. Recently I spent a lot of time organizing the files (mostly pictures and videos) on our computer. It took a long time, but now the system is in place. When I add new files to the computer, I name them according to the system and I will be able to find them very easily. It makes my life simpler. Again, a little hard work up front can make my life easier for years to come. Less thinking equals simplicity. Since companies will now allow me to pay my bills automatically, I have signed up. Almost every bill I have is paid automatically. I still keep track of them and monitor when they get paid, but I don't need to think about due dates. There are many other ways to automate your life, and some are weird and creepy. I'm not a automation guru, but I know you can have groceries delivered to your house and Amazon will deliver many disposable products to your doorstep at regular intervals. No thinking--just getting. You can typically accomplish this by keeping your mouth shut. Whether at work, on social media, or in your "real people" social circles, involving yourself in everyone else's business just adds stress to your life and distracts you from what you should be focusing on. Quit being nosy. Quit listening to gossip. Quit gossiping. Research and development is a large expenditure for many companies. Why? Because they are searching for what works best. It's worth it to search and search for the best, and once you have it, stick with it! I research products now and then, and once I've landed on the best one (in my opinion of course), I stick to it. I like to try new things, but I also have a love affair with things that really work well. For instance, I have purchased the exact same pair of tennis shoes at least ten times (I lost track actually). When one pair gets old, I buy another pair because they are the best tennis shoes I have every worn--hands down, no argument. So why experiment?